A few months ago, I discussed some of the many historical falsehoods spread by Fox’s reboot of the television show known as Cosmos. A professor of history, philosophy, and sociology of science at Michigan State University actually wondered if it was okay for the show to promote such falsehoods, because the ultimate goal was to get people to believe in a naturalistic view of the universe. According to him, this is a good thing, so perhaps it’s okay to lie a bit about history in order to achieve that goal. 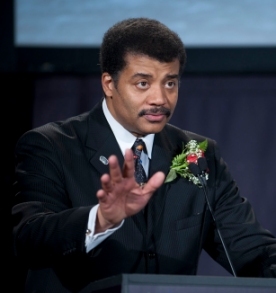 At the time, I didn’t want to blame the show’s host, Dr. Neil deGrasse Tyson, for these falsehoods. He’s a very likeable guy, and besides, he’s an astrophysicist, not a historian. I assumed that he was just reading a script and didn’t know enough to realize that the script was wrong. After all, Bill Nye had a similar problem when he didn’t understand the science behind a faked experiment that he narrated. Unfortunately, I think I was giving Dr. Tyson too much credit. Thanks to the folks over at Evolution News and Views, I was made aware of three articles at The Federalist which show that spreading falsehoods seems to be a pattern for Dr. Tyson. The first article discusses how he made up a fake newspaper headline, and in the process, demonstrated that he doesn’t understand basic statistics. The second article rehashes the first one and then gives an example of a quote Dr. Tyson fabricated as well as a supposedly true story he tells, the details of which seem to change as he tells it. The third article discusses another fabricated quote that demonstrates Tyson’s lack of Biblical knowledge. There is simply no excuse for making up quotes, headlines, and supposedly true stories. Now that I have read these articles in The Federalist, I wonder if Dr. Tyson had a hand in writing the historical falsehoods he spewed on Cosmos. It seems that would be in keeping with his standard mode of operation. One of the things that is most disturbing when this starts happening is that it cuts off the ability to debate the actual issues. Why? Because if one side is making up or shading facts just to support their idea, then you have to debate their character rather than the material. Which leads to a shouting match about who is lying or who is deceived, and that never resolves well. As a pastor/theologian, I had hoped such nonsense was restricted to us and social scientists, because I’ve seen it a great deal in our world. Hate to see it creep over into science as well–especially given the exalted place science and its stars hold in our culture. I stopped being surprised by these types of people years ago, there are too many of them. All they want is for others to blindly become intergrated into their agenda, not actually spread legitimate scientific literacy – because that might lead to questioning Evolution – think of the consequences! What bothers me most when I watch a show like Cosmos, one that treats the Evolutionary theory as the greatest contribution ever made to Science, is that, in general, people will see the information and interpretations presented there, and automatically take them as fact. Relatively few laymen bother to delve into further study after watching a science program. If Tyson did in fact have a part in the Cosmos script, I’m sure he is delighted when nobody questions a thing he says. I can’t help but think of this in terms of memes and meme survival: claim the authority of science, have your face affixed to various quotes all over social media, and in so doing inculcate us with materialist reductionism. It works on both the uneducated and educated, it provides a very clear description of who the “enemies” are, and is self-inflating for those who agree with it. I am not looking forward to having to deal with this in the future; it feels like the stirrings of science-Sauron. Yeah Doug, scientists do have a very “exalted” place in our culture. It’s certainly disappointing to see one like Tyson abusing the trust people give him. That doesn’t surprise me at all, S.M. If you read the article and follow the links, you will see that Tyson at first will not admit he made the mistake and additionally asserts his superiority at not making things up, then he admits that the quote was from a different event, the Columbia disaster, without admitting that he got the quote completely out of context. The more I read stuff like this, the more I think that the most important trait of a good scientist is that they admit mistakes. If you don’t have that skill, all of the others don’t matter. Thanks for letting us know how this has developed, Kyle. That quote by Faraday is spot on.